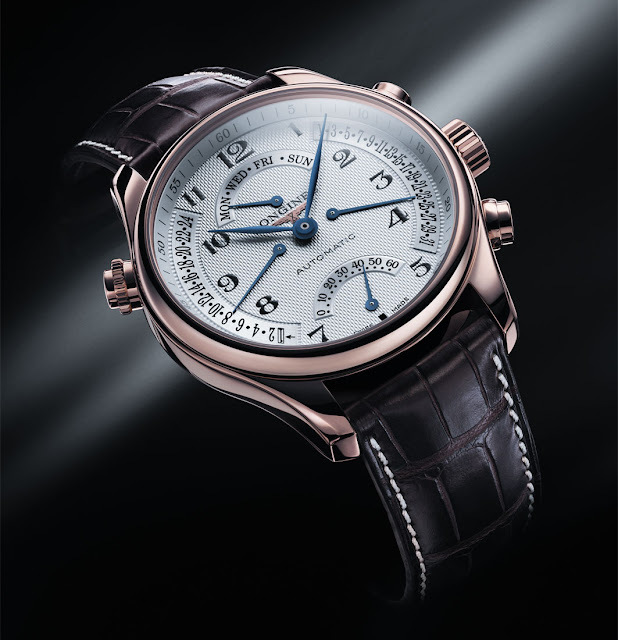 In order to honour its 175th anniversary, Longines has launched last year a timepiece bearing witness to its rich horological heritage and constant striving for elegance: This year the enhanced model of The Longines Master Collection Retrograde is also proposed in a 18 carat rose gold version. These watches, enclosing an automatic mechanical calibre developed especially for Longines, become the flagship model of a collection devoted to highlighting the horological traditions of the brand. 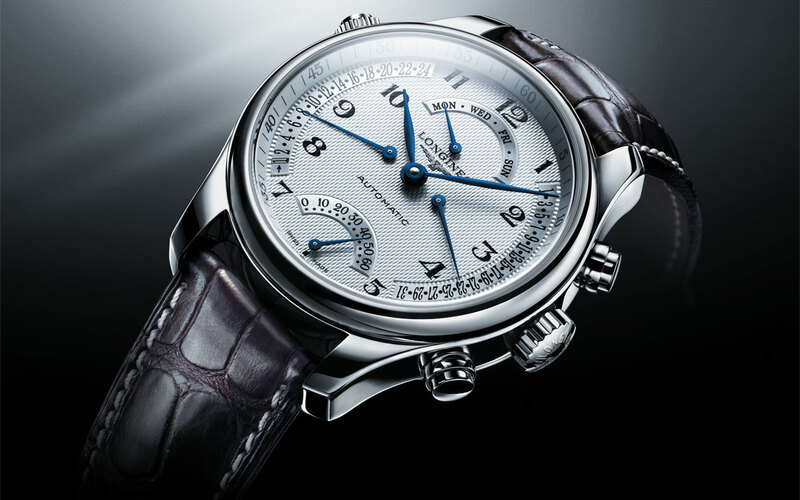 Over the years, Longines has dedicated numerous efforts to perfecting the mechanical measurement of time. A creator of horological movements, the Saint-Imier-based firm has nevertheless also assured that a touch of added refinement always forms a part of its creations. Longines has always regarded elegance as being the fundamental underlying principle in both the arrangement of the watch calibre and in the aesthetics of the final watch. Faithful to the 175 years of its watchmaking tradition, Longines has today realised a synthesis between its technical and aesthetic heritage in the creation of a new flagship timepiece representing its collection of horological tradition: The Longines Master Collection Retrograde. Enclosing an ETA calibre specially developed and made exclusively for Longines, The Longines Master Collection Retrograde forms part of a collection of sober, elegant timepieces, the heir to the watchmaking past of the firm with the winged hourglass. Offering retrograde functions (day, date, seconds, second time zone on a 24-hour scale) in a movement with automatic rewinding, The Longines Master Collection Retrograde combines a mechanical horological complication with simple usage. Apart from showing the time, its functions include a display of the day, set at 12 o’clock, a calendar on the right of the dial, a second time zone on a 24-hour scale to the left and a subsidiary seconds hand at 6 o’clock. These four functions are retrograde: that is, the hands indicating the information instantly fly back to regain their starting position once they have reached the end of their travel. Dancing in harmony, the seven hands trace out a graceful ballet, making this timepiece a captivating article to own. The Longines Master Collection Retrograde stands out for the clarity of its dial and is available in one version with the four retrograde functions (day, date, seconds, second time zone on a 24-hour scale), which are housed in a stainless steel or rose gold case with a transparen sapphire cristal case back. 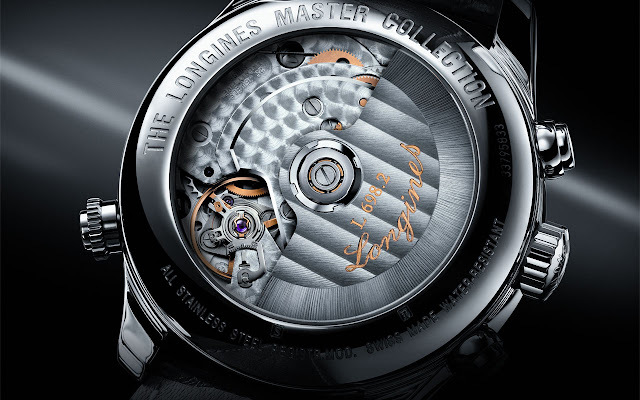 This reveals the decorated movement and the oscillating mass adorned with the Longines logo. Available in 41mm or 44mm diameter sizes. The stainless steel model can be supplied with either a steel bracelet or an alligator-skin strap in dark brown or black and triple folding clasp. The gold version of the watch is available with a dark brown alligator-skin strap. 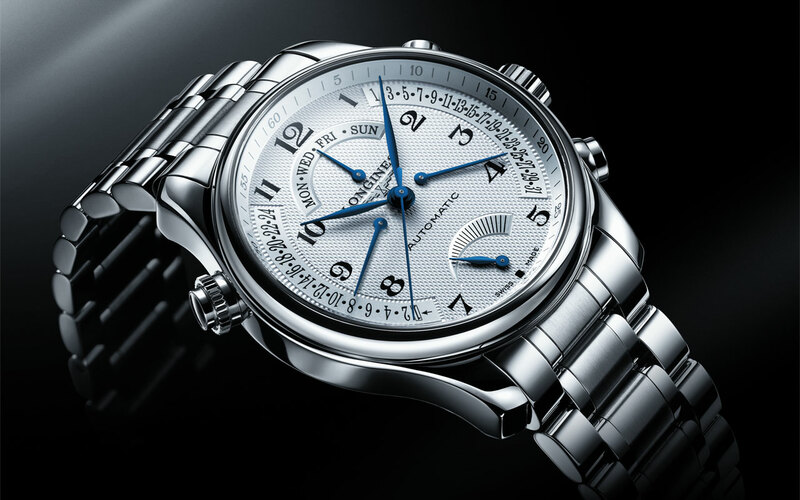 The Longines Master Collection Retrograde is also available in a version with power reserve indicator. This model includes three retrograde functions (day, date, second time zone on a 24-hour scale). Beyond its pure design and care given to the finish, the elegance of this watch lies in the combination of polished indices, silvered dial with “barley-corn” decoration and blued hands, the distinguishing mark of the traditional horological series called The Longines Master Collection.